My plan was to write about these delicious cookies while eating a few and unfortunately I am unable to do so because someone (I will find you) ate all the my cookies. 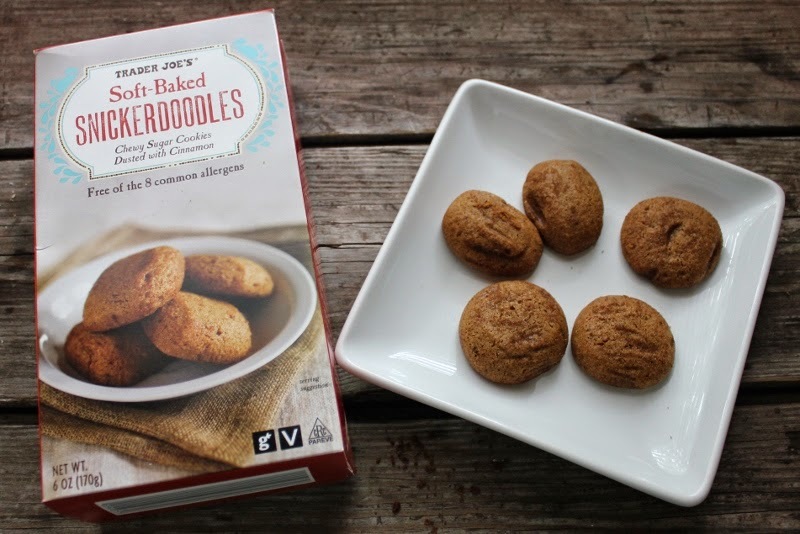 I was told about these soft, chewy cookies one afternoon by a fan of Trader Joe's. I immediately jotted them down in my mental Trader Joe's List and 2 days later I totally understood what the hype was about. Their name on the box is a mouthful, but describes the cookies to a tee with the exception of not mentioning they are extremely addicting and extremely at risk of getting eaten by those around you; so be careful and choose a good hiding spot. The last time I bought these ( I'm still steaming over the fact I only had 2 from the entire box of 12) the guy working the register provided me with a fantastic tip- heat them in the microwave for a few seconds, put them on top of a scoop of ice cream with Cookie Butter on top. How was that mental picture? I about died imaging how the whole ménage à trois would go down and how it would be repeated until every last cookie was delivered into the pit of my stomach. So naturally, I paid and jolted out of Trader Joe's before I took his advice and packed on a delicious 10 pounds. (But seriously, I am going to try this sometime soon.) If you beat me to it, leave a comment about your euphoric experience.